Friday, March 15, 2019, 7 p.m. - 9 p.m. 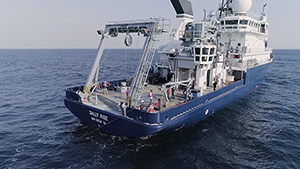 In December 2017, a team of scientists and artists set out from San Diego aboard the RV Sally Ride to investigate the effects of the Thomas Fire, a massive wildfire that affected California’s Ventura and Santa Barbara Counties, on the Pacific Ocean’s biogeochemistry. Created during the expedition, this documentary explores the benefits of collaborations between art and science. Washington, D.C. premiere. Run time: 26 minutes. Directed by Gad Girling. Funded by the National Academies Keck Futures Initiative. A discussion follows the screening with Gad Girling, Director; Dustin Hayes, Composer and Writer; and Kelsey Bisson, Co-Chief Scientist on the expedition; and JD Talasek, Moderator, Director, Cultural Programs of the National Academy of Sciences. This screening is part of the Environmental Film Festival in the Nation's Capital.